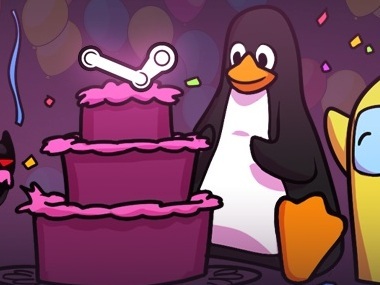 Linux mascot Tux the penguin with a cake bearing the logo of Valve’s games store, Steam. That’s Linux Foundation executive director Jim Zemlin, praising the managing director of Valve. It’s not an uncommon sentiment — Newell’s games studio, which he co-founded in 1996, frequently earns comparisons to Apple by way of its rabid fans and quality-over-quantity philosophy. But Zemlin isn’t just saying that because he’s a fan. This year, Valve made a big commitment to Linux by pledging that the open-source operating system would be at the core of its PC-console hybrid gaming hardware line, the Steam Machines. Today, Valve is officially becoming a paying corporate member of the Linux Foundation. With dozens of other companies already filling up the membership ranks, this is more a symbolic step than anything else. However, it makes official Valve’s previously assumed goodwill toward the Foundation’s cadre of fellow pro-Linux companies and open-source developers, whom it might need as the first Steam Machines start to come to market next year. “People shouldn’t underestimate the Linux community’s desire to have gaming on the platform, and for it to be insanely good,” Zemlin said. Indeed, Valve’s Linux-cheering this year — even though the vast majority of its users currently game on Windows — seems to be a long-term bet. Zemlin characterized it as a necessary move to keep Valve’s popular PC games store, Steam, safe from Microsoft’s own app and games stores for Windows 8 and the Xbox consoles. With Valve now promising not to make exclusive games for Steam Machines, there are plenty of unanswered questions about how it will be competitive with the Xbox and, well, everyone else in the living room. Zemlin, of course, doesn’t seem too worried.